We are a choir for inexperienced singers who would like to enjoy singing with increasing confidence, knowledge and skill. We are based in Sheffield, UK. Very important to us is the wide range of repertoire we sing. Music of many types, genres and styles: musicals, folk, pop, rock, classical and world music, to name just a sample. A full list of our repertoire to date and our past programmes is available on the music and concerts pages. 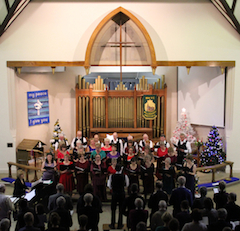 Typically we will have a programme consisting of movements from a major work like Vivaldi’s ‘Gloria’ or a sublime motet like Mozart’s ‘Ave Verum Corpus’, with perhaps ‘Hit the Road Jack’, ‘If you’re Going to San Francisco’ and some ABBA. Songs from ‘Les Miserables’ and ‘Carousel’ with arrangements of great folk or traditional songs like ‘Gaudete’ or ‘An Irish Blessing’ will rub shoulders with the medieval classic ‘Sumer is icumen in’ or the early Tudor ‘Ah Robyn’. The curious and tricky traditional Venetian song ‘Gobbo so pare’ (a song about a hunchback, in Venetian dialect) will be complemented by Aretha Franklin’s ‘I say a little Prayer’, ‘The Entertainer’ and Green Day's "21 Guns". We believe variety is the spice of life and makes for an enjoyable and rewarding programme for singers and our all important audience. There is also a range of demand from challenging four part choral music to songs we sing in unison or with simple harmonies we can relax and enjoy without too much blood, sweat and tears. The ability to read music is not essential. Saturday 13 July 2019 at 19:30, our summer concert at Millhouses Methodist Church. Click here to request a ticket.